A good Head Start is terrific but puppy’s education really begins at home with his family. 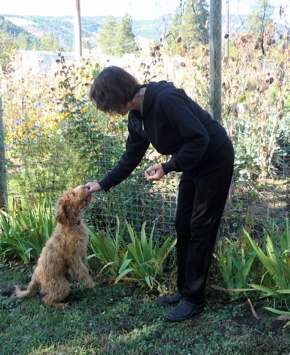 Training begins here at Over The Moon Labradoodles but it is continued by a puppy's family. A great dog is born with good characteristics but is taught by his family to be a functioning canine member of human society. "If you think dogs can't count try putting three biscuits in your pocket then giving Fido only two of them "
No matter how many times you have watched puppy training programs on TV there is nothing like a formal class to socialize your puppy. Trips to the dog park are not a substitute for a good class that includes recess. 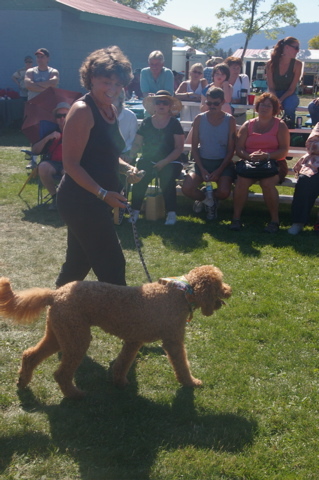 Even if you are an expert dog trainer she will benefit from a good school. As with children school is not just about the information they learn but it is the entire structure and social activity of the class. It is always rewarding to take a puppy to dog class who with a little homework will be the A student. Your Labradoodle Puppy will learn very quickly. If puppy decides he ‘doesn’t like’ something such as his crate, leaving your property, riding in the car, staying in the house alone, or other things that are part of a doggie life don’t give in to him. If doggie hates to be groomed take him to the groomer for just a few minutes and a brush up. If he wants to stay home carry him off to a busy place, distract him with cookies, keep the experience short but do it as often as possible. His crate can end up being a very safe and lovely place to be. Introduce it perhaps in the car when you are going to a place she loves. Give her a chewy in the crate. Don’t give up on things doggie should do because she is shy or stressed. If doggie is stressed in the car take her for many short rides with a fun destination. Don’t give up. We can create neurotic pets fairly easily and then we have to live with that for the next 10 to 15 years. Some puppies get car sick. This does not mean puppy will always throw up on the way to the dog park. We have had families give puppy a tablespoon or two of pumpkin before the journey and that has worked quite well. Just be persistent because you are making patterns that will last a long time. When the big day arrives and puppy comes home the first thing you will have to consider is housetraining. Puppy goes to the bathroom frequently – probably more frequently than you believe. Puppy goes to the bathroom when she wakes up….right away. When puppy sleeps put her in her own crate. We will have started her crate training here. You then can wake her up when you think it is time. Or she will scratch or call you when she is awake. At first carry her outside to the spot you wish her to go. Praise her and give her a great treat when she has gone in the right spot. Imagine the concept – Peeing for Cookies! She will soon see That this is a better deal than peeing under the dining room table. When puppy is playing in the house I set my oven timer because I easily forget that almost every hour puppy has to go to the bathroom. This of course changes rapidly. Smaller dogs have smaller bladders and go frequently. Bigger dogs seem to hold the pee longer. If your puppy objects to her crate during the day for naps give her lovely chew toys that are only in the crate. Make her crate a lovely and special place. It is true that some leave puppy in the crate for three hours or so during the day while they work or are out on errands. This is not puppies favourite thing if it becomes too much. If you must leave puppy for great lengths of time like this perhaps a pen with a potty box, bed and toys is a better plan. Labradoodles are social creatures and for this reason we no longer place puppies in families where they must be left every day while people go out to work. What Shall I Chew This Morning? The Woodwork? The Fluevog Shoes? My Peanut Butter And Cookie Kong? Your puppy will chew. That’s what puppies do. Many families ask me if as a breed they chew. Some puppies do chew more than other puppies but when those teeth are growing in or they are bored puppies will chew. Don’t buy puppy a chew toy. Buy puppy many, many chew toys. They are cheaper than your friend’s new boots. Fill the house with appropriate toys for dogs so there are more yes toys than no toys. We have had puppies who have been at a stage where our kitchen woodwork and chair rungs were still the chew toy of choice. I put a few spoons of olive oil in a cup and added an extremely generous dose of cayenne pepper. I gave my wooden woodwork and furniture a bit of a polish. It didn’t hurt anybody, we were sure that Lexi quite liked it. However a few treatments with the cayenne polish and the chew toys won the day. Puppies should not have unsupervised run of the house. It is too much for them to handle. The minute they get bored they will chew on your great stuff. One puppy I know chewed up all of the vintage cushions one long summer afternoon. Your puppy will need to learn to spend time home alone. This is part of his education. We have our little man Dundee who we never left alone, didn’t need to and it never came up. He either had us or several doggie friends to keep him company. When our daughter wanted to take him to be her companion he just couldn’t do it. He howled when she took out the garbage and honked the horn if she left him in the car. He missed out on a really wonderful life as only puppy who could go to work and be a therapy dog in a long term care hospital, a job he loved. Back he came to us and is living out his days as one of the group. During puppy’s first few days and weeks teach him to be self sufficient. Give him a confined space such as a pen in the kitchen. Give him some lovely and interesting chew toys and let him amuse himself for a while without you hovering over him. Gradually learning how to be alone either for an hour in his crate or a couple of hours in a pen with a bathroom facility is essential. The worst thing for both you and puppy is anxiety separation. 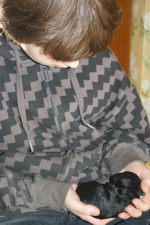 Although sometimes I would love a day with nobody it is important for our puppies that they meet new people every day. If a puppy hasn’t met lots of kids, men, workers and experienced noise and chaos by the time they are three months old they will be shy and fearful. 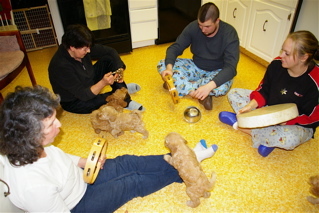 We begin the process and it is important that each puppy family continue. If when puppy goes home with you they don’t continue meeting and greeting new people they will regress. A fearful dog ends up snapping, biting and many end up in the pound. Your puppy’s social calendar should be full. We all have met the dogs who are relegated to the basement when the company comes because the owner has no idea how the dog will behave. This is no way for anybody to live. Dogs are instinctively social creatures. Your puppy needs to be protected from disease by not going to the dog park until he is fully immunized but he can go to your friend’s house and he can go to a puppy class where the puppies have been immunized. He needs to meet people, children and dogs of all sizes. His first encounters should be supervised. A Doberman lunging at him or a little boy poking him with a stick is not good socialization. However keeping a small dog with only small dogs is not a good idea either. We had Yorkies who had Napoleon complexes and thought they ruled the world because we had been afraid to allow them to get used to big dogs in a calm setting. That being said, over the years we have had several serious injuries as the result of puppies big and small having times of unsupervised play. Little bones break easily. If a doggie bites - even sometimes when he may have a reason - it could be a death sentence. Puppies like babies experience the world through their mouths. Puppies chase and nip and mouth your hand. We have noticed some litters mouth more than others but all of the puppies do it. It is an essential part of their growth and development. If a dog doesn’t mouth you as a puppy he will never know just how strong his jaws can be. When puppy puts his mouth on you cry out ‘ouch’. Don’t say it politely … scream! Some puppies stop immediately. If puppy is a little thick skinned scream your ‘ouch’ even more loudly and lick your wound refuse to play. This is doggie language for ‘if you bite I won’t play with you’. Punishing is never the answer. Nipping and biting is a behaviour essential to his development. Learning that nipping and biting a human is not a great way to play is the next step and a step that only you can teach. If puppy doesn’t pay attention cry out your ‘ouch’ and leave the room. When he hurts you the game ends. In a minute have him come and sit in front of you and then resume your game. It is important puppy knows you love him you just don’t really care for the biting. As puppy grows you might notice her becoming possessive about things. I remember the shocking moment when my gentle standard poodle Annabel growled at me when I tried to take away her prized pig’s ear chewy. This is a distressing behaviour and it is important your dog give up dead bird carcasses, chicken bones and other potentially dangerous goods. As soon as puppy develops a love of her many chew toys begin the trade up game. “Hello Etta” I say to my puppy. “You have a bully stick but I have a piece of dried liver – trade ya”. She gives me the bully stick, I give her the liver, she eats the liver and I give back the bully stick. Everybody is happy. If you practice this when there is no real reason for her to give up anything she will give up the dangerous chicken bone that is halfway down her throat without a struggle. Your Puppy needs to learn that coming back to you when you call can be fun! If puppy says ‘just a minute’ turns around and runs away the human reaction is becoming annoyed. However, if you scold her she will think twice about ever coming back to you. As soon as puppy comes home put some ordinary puppy kibble on the kitchen counter and in your pockets. Whenever you think of it (and please think of it often) call puppy by name and have him sit in front of you by placing the kibble so he has to sit in order to get it. Praise him a lot and pat him at the collar. Give him the treat and tell him to go and play again. Touch his collar because then when it becomes necessary to grab a dog by his collar he is not upset. If this is something you do every day as many times as possible your dog will love to come to you. When he is older and goes through the “you’re not the boss of me” stage up the anti. Give him something wonderful like a fancy treat or a bit of chicken. Gradually he will come without a treat. However, the idea is that he will never know when there is something wonderful waiting for him. When she is being naughty and not coming because there is a deer running up to the fence or some other irresistible thing find a wonderful treat. When the naughty dog finally comes back she will have a reward so amazing that the next time she will make a bee line just for you. Many people have said their dog is not food motivated. This is a learned behaviour. We begin to teach them to be food motivated and their family continues the pattern. 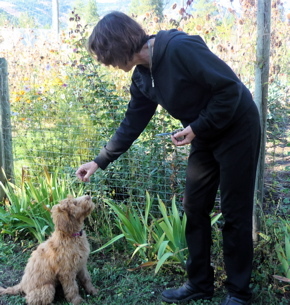 If you begin by feeding some of puppy’s lunch or dinner by hand as a reward the puppy will learn that food is the fabulous reward for learning.